Palma’s Fortress of Sant Carles celebrates a 400 year anniversary this year. Around the year 1600, the Mallorca’s Col·legi de la Mercaderia (Merchants’ Guild) proposed the construction of a stronghold to protect the harbour of Porto Pí. King Felipe III gave order to construct such a fortress in 1608; kings are usually on the slow side. Building work began in 1610 and was completed in 1612. The funding was divided between the monarchy and the Merchants’ Association. The fortress was first called Castell de Portopí and later renamed as Fortalesa de Sant Carles, in homage to the Viceroy of Mallorca, Carles Coloma de Saa (1567-1637). The fortress became Mallorca’s most substantial fortification, together with the Mediaeval city wall. In 1662, the fortress was expanded, and once more, in 1890. 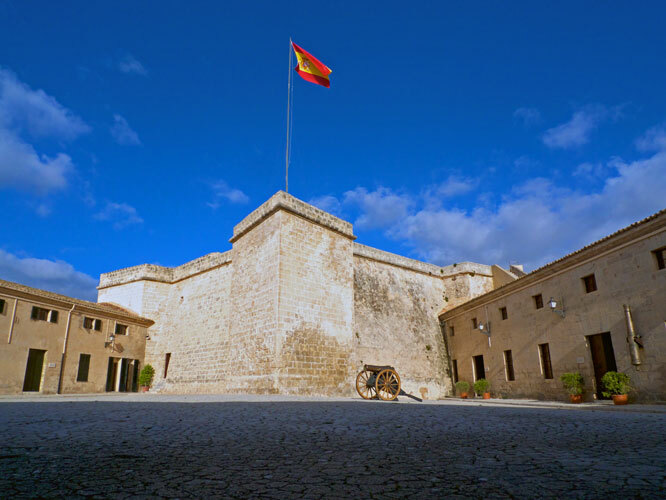 During the 18th century, the Castell was used as a hospital for tropical diseases. At the time of the Spanish Guerra Civil (Civil War), the castle was decisive in anti-aircraft resistance; once the Republican movement was defeated, Sant Carles also served as a military prison. Now, Sant Carles is home to the Museu Històric Militar (Army Museum). The display arrangement has recently been remodelled. The Sant Carles museum is worth a visit; opening hours are from Monday to Friday (09h00 to 13h00) and Saturdays (10h00 to 13h00). Entrance admission is free. The photo was taken in Palma, Mallorca, Baleares, Spain. The date: January 7th, 2012. The time was 10:21:08. When you say this fortress was used in the Spanish Civil War “for anti-aircraft resistance”, could you explain who was who in this resistance movement? To me, ‘resistance’ signifies the struggle against the military coup-d’etat launched by the army against the democratically elected government of Spain (i.e. against the Republic). Most of the military installations in Mallorca were constructed by the Franco regime to impose or maintain Fascist rule against any possible republican resistance. Coudl you clarify, was the fortress of Sant Carles used for or against the resistance? i’m sorry if i wasn’t clear in my blog entry. mallorca was one of the first spanish regions to be overwhelmed by franco’s troops after his coup d’etat. republican resistance only held out for about ten days in the east of the island, around portocristo. yes, the fortress of sant carles was used by the fascists against some air attacks carried out by republican resistance groups. later, such resistance members were incarcerated in sant carles. the history of the guerra civil in mallorca is quite an interesting one, sad as it was. there is still a taboo around it all, here on the island, seventyfive years on.